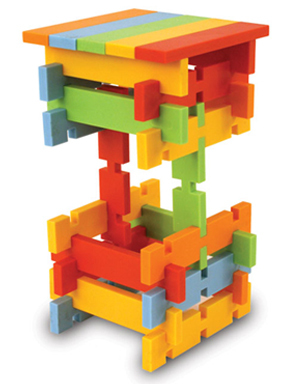 A Modern Twist on Classic Stacking and Building Toys. 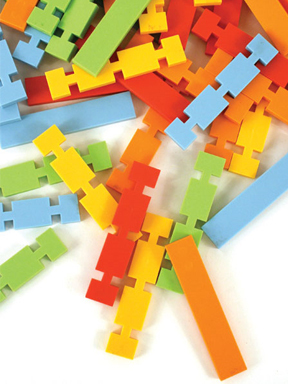 These brightly colored plastic planks are not your average building block toy. Sure there are 51 normal style planks in the set, but you also get 55 pieces that have integrated notches. This makes the set incredibly versatile and able to be used alone, or along with other regular planks you might have already. With Dado, children are able to build amazing structures that are completely unique, and not at all possible with traditional sets alone. The notched planks each have six indentations that allow children to stack and pile to create like never before. Once set in place, the notches hold each plank securely in place, to increase design possibilities and the overall stability of the structures children build. The result is more elaborate configurations that are super sturdy. These planks are less frustrating for children because they prevent tipping, sliding and other accidental situations that normally result in frowns and tears. Your kids will find them easy to work with, and you will love all of the great things they build. 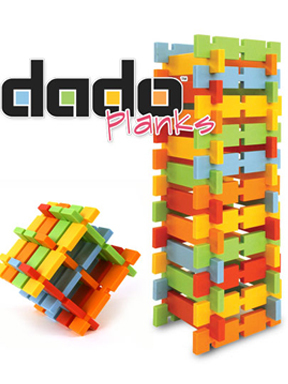 This remarkable construction toy is part of the Dado family which also includes Dado Cubes and Dado Squares. This durable set of plastic building blocks is made from recycled material, but it doesn't really show. You can feel good about giving an eco-conscious toy, and kids can enjoy it and treat it just as rough as any other. With tough materials and vibrant colors this set of planks is sure to be a favorite of parents and children alike. It is perfect for just about any child over the age of three, and will grow along with your kids too. Younger children can build and stack simple structures, and older kids will amaze you with the large, elaborate towers and fortresses they make. Each of the special planks features precise notches which can connect and interlock with the other pieces to build all sorts of cool configurations. Not wanting to mess with a good thing, it also includes standard building planks in the varying colors to provide a combination that is out of this world! Dado Planks are an innovative twist on classic building planks and are loaded with educational benefits. They are specifically designed to accommodate the building of large, intricate structures, and will inspire logic, reasoning, fine motor skills & limitless imagination. This great building set is designed to accommodate the construction of large, intricate structures with endless possibilities. Children will experience a rewarding outcome while building in the context of fun play. Each piece is able to interlock precisely which makes for strong and sturdy towers and buildings. Thanks to the dimensions, you can also use these planks with other ones you already own too. Stellar versatility in configuration along with vibrant, saturated color and durable, heavy gauge plastic make this toy perfect for even the youngest builders. Fully safety tested & approved! 106 pieces, 55 notched and 51 standard planks. Storage bag included. Order Yours Today! 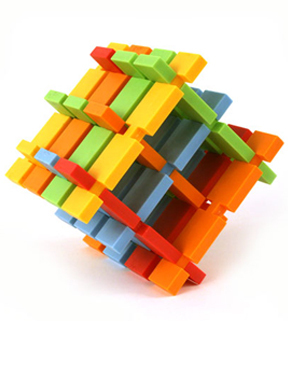 Dimensions (l x w) 1" x 4.5"
Dado Planks - Discover hours of stacking and building fun. Your kids won't want to put them down. Dado Planks are a favorite of boys and girls alike. Bright colors and endless possibilities make them perfect for all ages. Order Yours Today!